Oh my gosh, guys. Company Triple Cheese and Bacon Macaroni is awesome. I love a good mac and cheese recipe anyway. This one is really superb. Plus, it makes a lot! Company style. 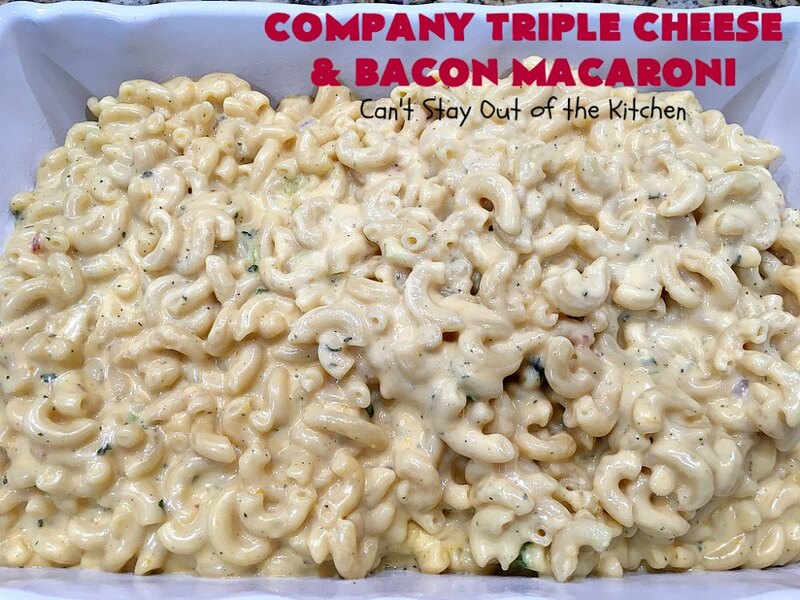 This recipe makes two 9×13″ baking dishes full of macaroni and cheese. Seriously, it’s probably about 30 servings worth. 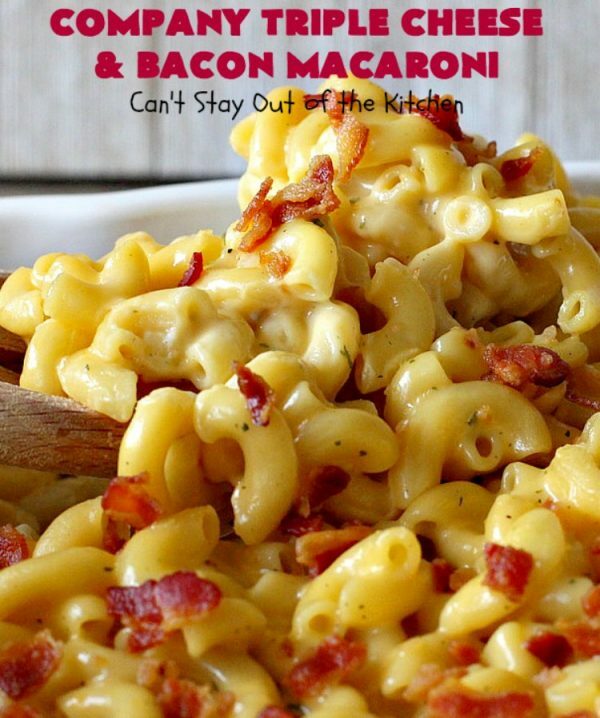 So if you don’t need that much mac and cheese, then cut the recipe down by a half or even to one-fourth. I used three different kinds of cheese for this macaroni dish. 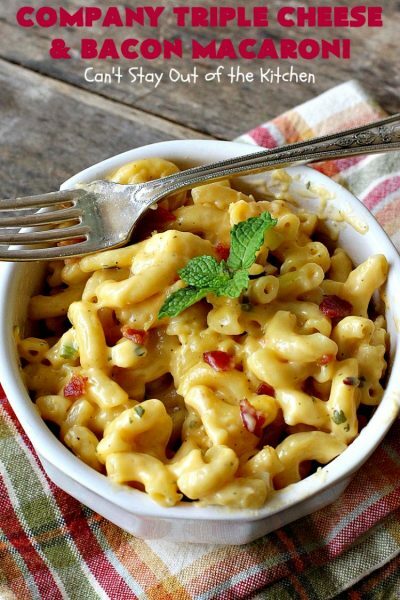 Velveeta, sharp cheddar, and a cool smoky bacon cheddar cheese. I couldn’t resist buying it when I saw it at the store. 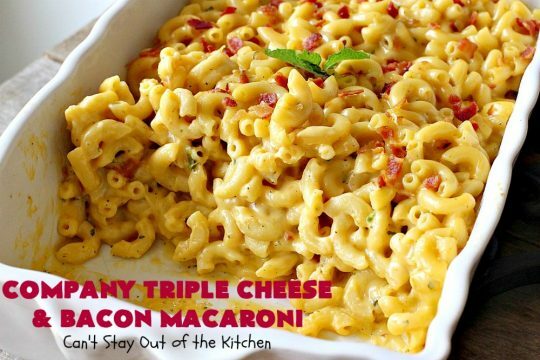 The only thing I would do differently about this recipe is use TWO packages of the cheddar cheese with bacon rather than one. It makes a thick creamy sauce. I added a few drops of hot sauce to get just the right amount of punch. 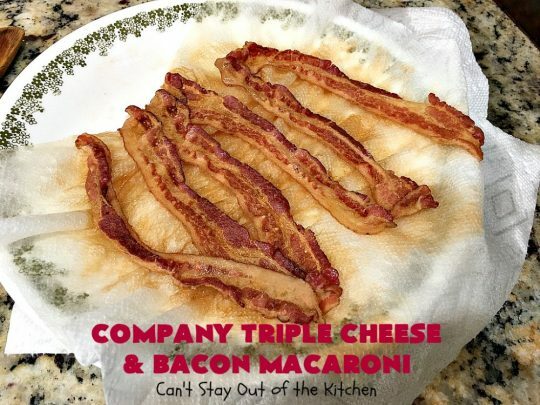 Then it’s covered with bacon on top. Yum. Talk about delightful. I was asked to prepare a meal for our monthly Connection Class at church. This is a class for new members interested in joining in our church. They wanted BBQ Brisket and whatever sides I wanted to make. I chose to make Coca Cola Baked Beans, The Best Deviled Eggs, That Good Salad and a Oreo Cookie Mud Pie. 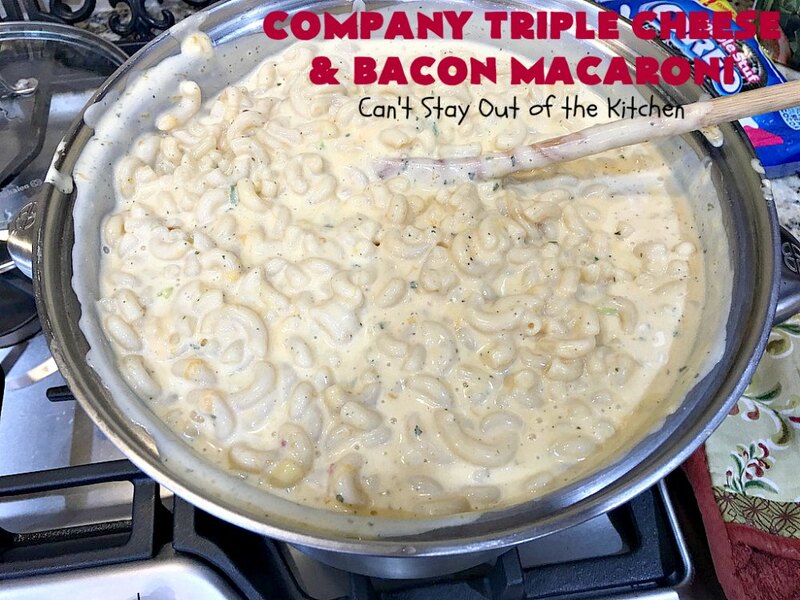 I also made this Company Triple Cheese and Bacon Macaroni so I could provide a more kid-friendly meal. Here in Texas, everyone seems to serve Mac & Cheese with BBQ Brisket. Yeah, bring it on! 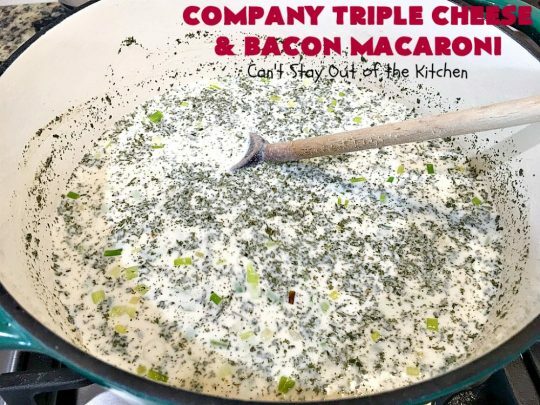 I have made this recipe multiple times. You do not have to bake the casserole if you want to serve it straight from the pot. (I usually serve it straight from the pot). I personally prefer using two pounds of macaroni (rather than three). I like using all half-and-half (rather than only two cups). I use 16-oz. Velveeta, two 6.67-oz. packages of smoked cheddar cheese with bacon, and two 8-oz. packages of regular cheddar cheese (rather than only one package of smoky cheddar cheese with bacon). It is so creamy in this combination. But since my pictures are from the earlier version I’ve included those instructions too. 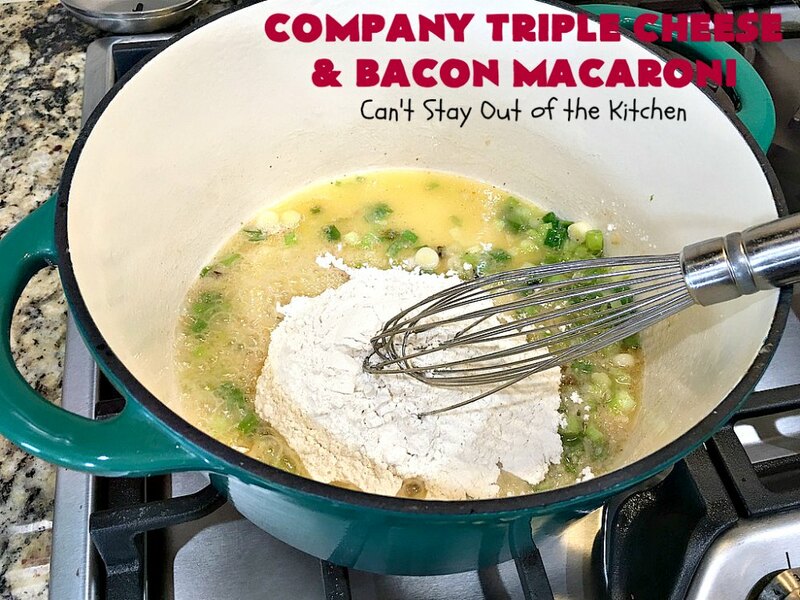 If you’re looking for an absolutely mouthwatering mac and cheese recipe, Company Triple Cheese and Bacon Macaroni is your recipe! 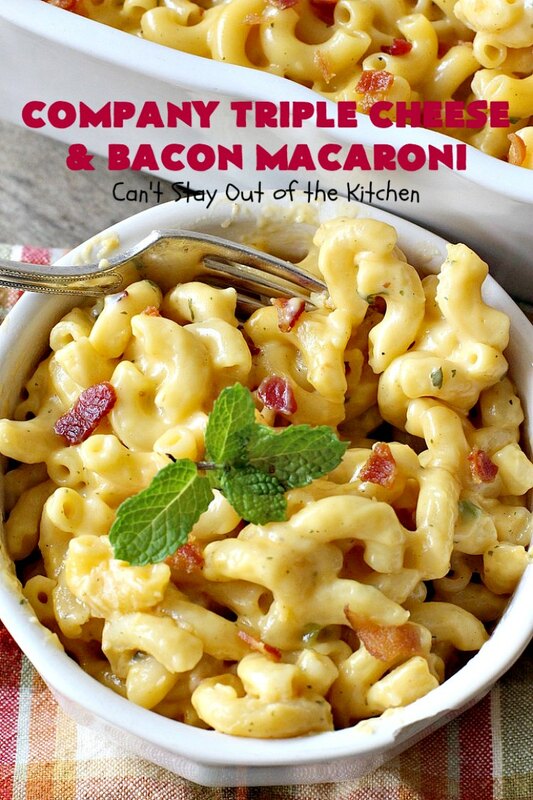 It’s cheesy comfort food with a side of bacon that will absolutely wow you! Enjoy. 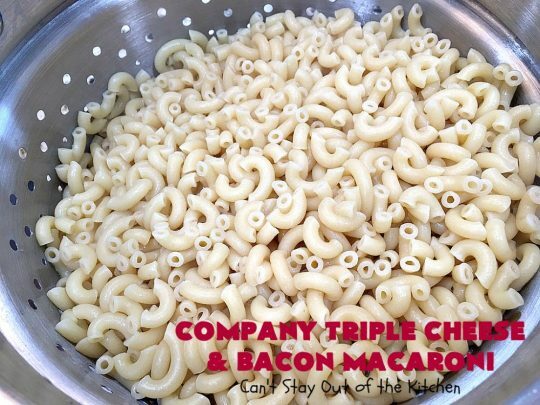 Company Triple Cheese and Bacon Macaroni is so mouthwatering. 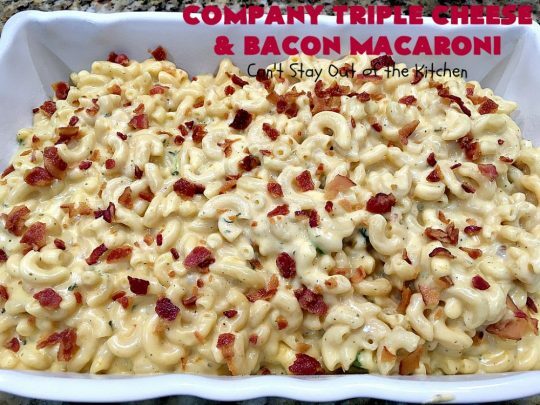 This is a wonderful kid-friendly dish. Every bite of this cheesy mac and cheese entree was amazing. Melt butter in a large Dutch oven. Add green onions and saute. Add milk–about 1/4 cup at a time and work into mixture until smooth. Add cheddar cheese with bacon and sharp cheddar cheese. Add Velveeta cut down in cubes. Crisp fry or microwave bacon until cooked. Crumble into pieces and set aside. Here all the cheese is melted and sauce is thickened. 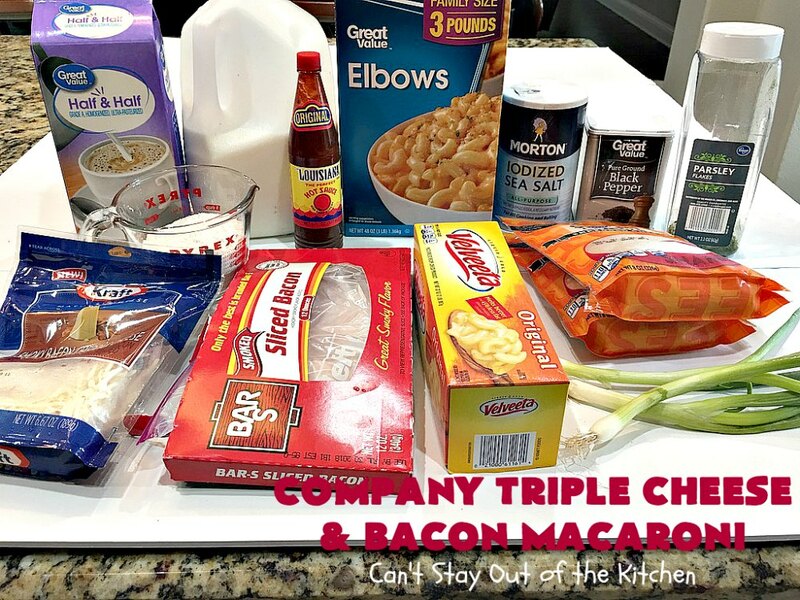 Cook elbow macaroni according to package directions except to al dente. Drain and run cold water over the noodles. Drain again. Add cooked macaroni into the cheese sauce. Grease two 9×13″ casserole dishes. 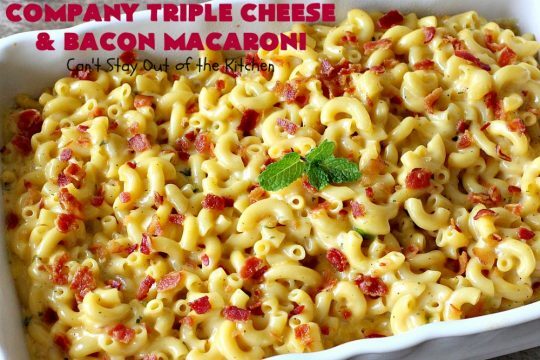 Pour half of the macaroni into each dish. Cover with foil and bake about 15-20 minutes or until dish is hot and bubbly. Seriously, you’ll be drooling after the first bite. Serve Company Triple Cheese and Bacon Macaroni when you have a lot of company. Everyone will enjoy it. 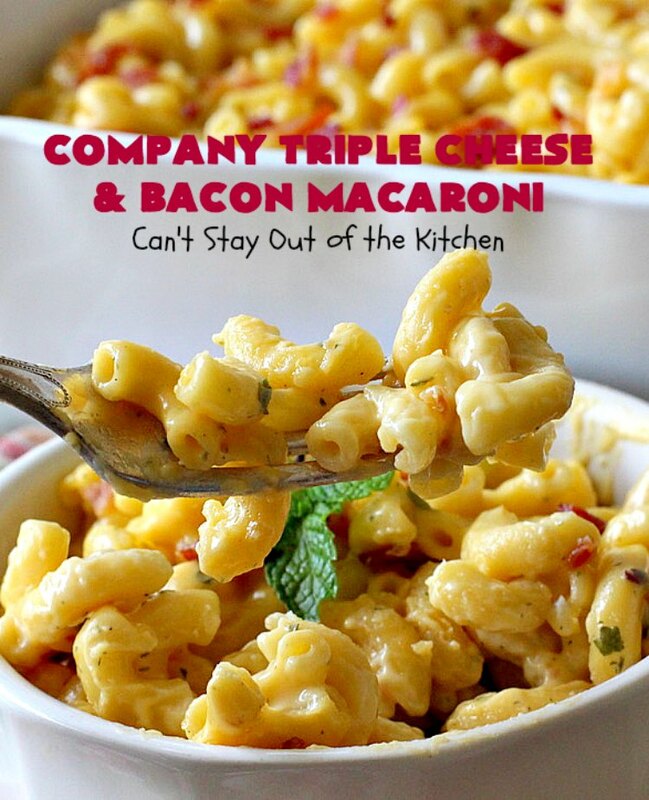 If you’re family likes mac and cheese dishes, you’ll love Company Triple Cheese and Bacon Macaroni. 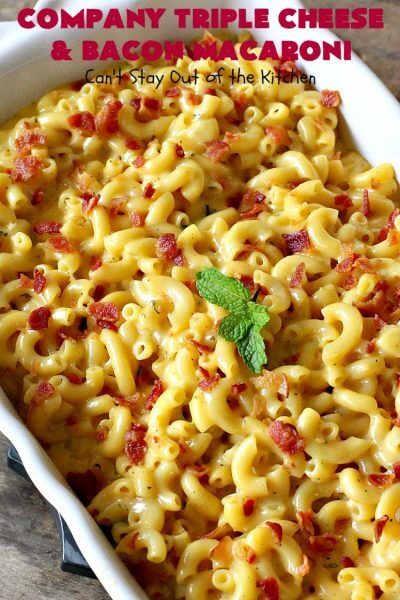 This mouthwatering macaroni and cheese dish is filled with three cheeses and bacon. 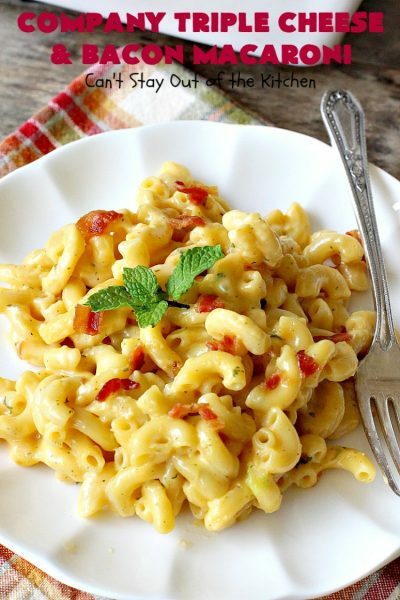 This creamy, cheesy and savory macaroni entree will have you salivating after the first bite! 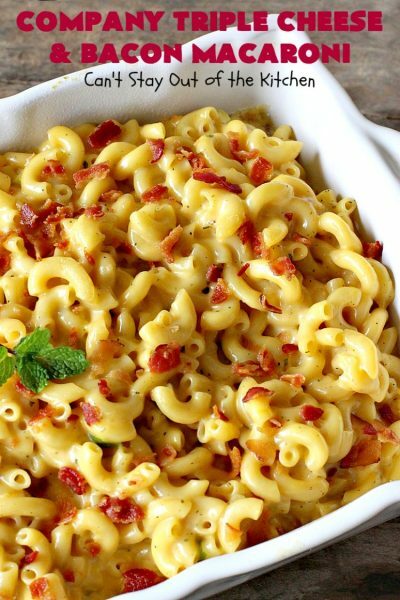 It's kid-friendly and totally wonderful comfort food any time of the year. Grease or spray two 9x13” glass baking dishes. Drain, set aside on paper towels to drain. When bacon is cool, crumble into bite sized pieces. Meanwhile, bring a very large 16-qt. stock pot filled about 2/3 full of water to a boil. Add macaroni and cook according to package directions, except al dente. In a large Dutch oven, melt butter over low to medium heat. Add green onions and saute until tender – a couple of minutes. Add milk about ¼ cup at a time until all the milk is incorporated. Add half-and-half the same way. Season with salt, pepper, parsley and hot sauce. Combine with macaroni and pour into prepared baking dishes. 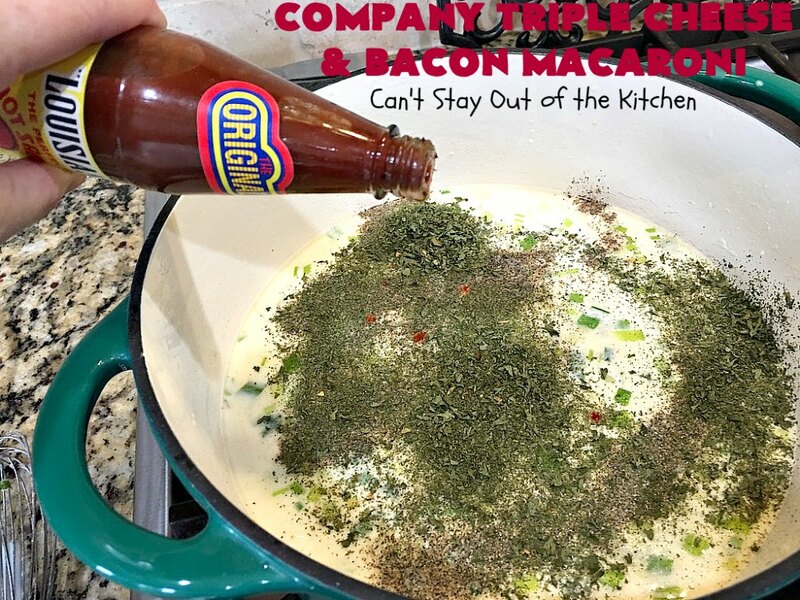 Sprinkle the tops with the bacon. Bake at 350 degrees about 15-30 minutes, or until hot and bubbly. NOTE: While you can eliminate the parsley, if desired, I highly recommend not eliminating the hot sauce. 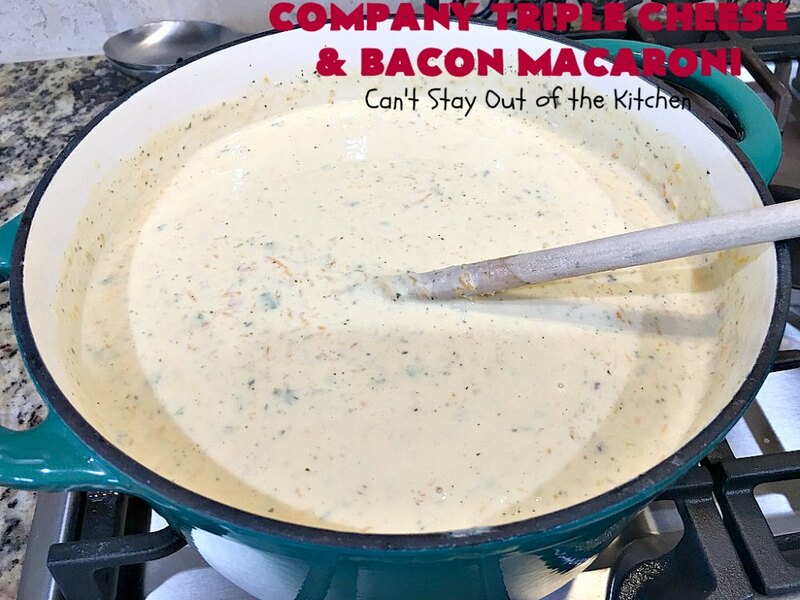 It gives the macaroni the kick it needs to keep the sauce from becoming too bland. NOTE: I microwaved the bacon between two sets of paper towels on a microwaveable plate. I microwaved the bacon approximately one minute per piece of bacon on each plate. NOTE: If you want a stronger bacon flavor, use two packages of smoky bacon cheddar cheese. 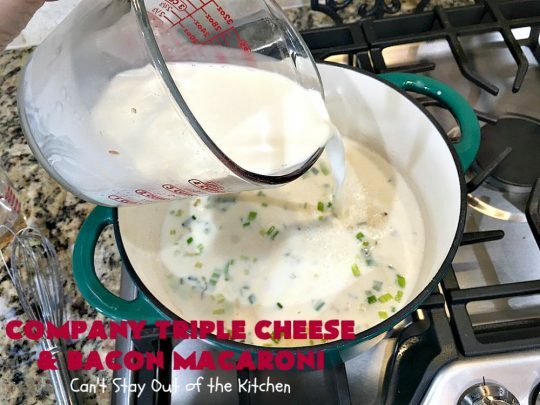 NOTE:I have used multiple combinations of cream and cheese for this recipe. Those combinations include using all half-and-half, part whipping cream, and/or adding an extra package of smoky bacon cheddar cheese. You can also add additional bacon, if you desire. NOTE: You can combine the cheese sauce, cooked macaroni and bacon in a large pot and serve straight from the pot without baking as a casserole, if you desire. The recipe will actually stay creamier that way. NOTE: I have also partially made the entree the day before to save time. 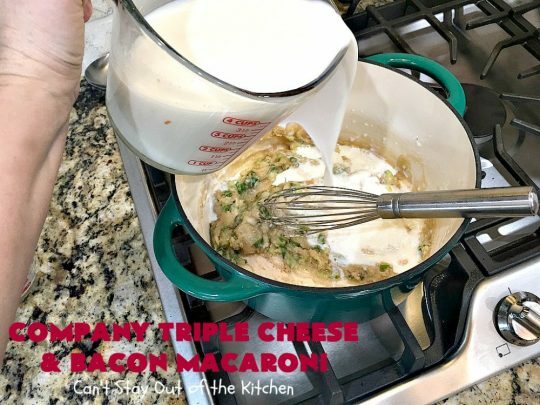 I made up the cheese sauce and fried and crumbled the bacon the day before. Then on the day of serving, I cooked up the macaroni. After draining, add sauce and bacon and heat through. 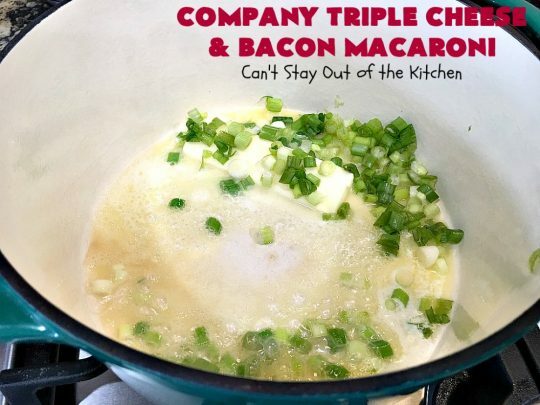 NOTE: This recipe is creamier if you use only two pounds of macaroni. The first time I made it I was trying to serve 30-40 people so I used three pounds. 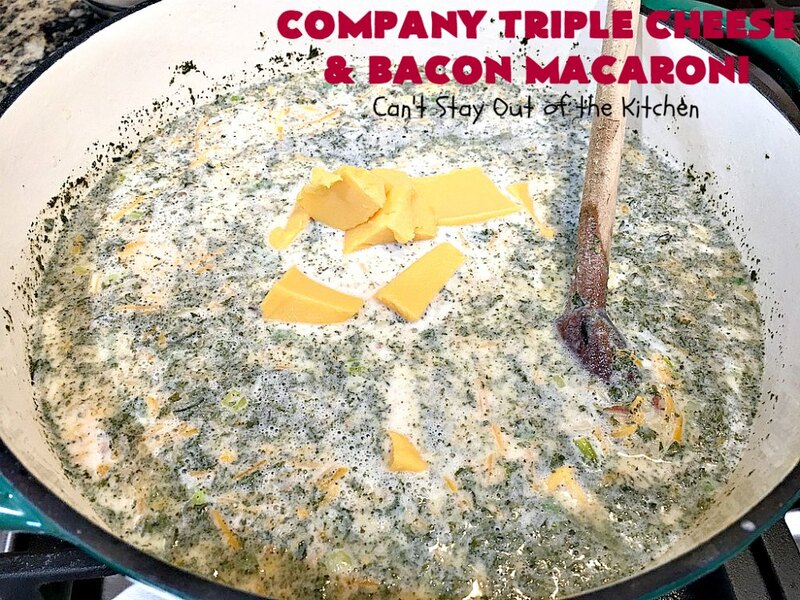 Company Triple Cheese and Bacon Macaroni is supreme comfort food. 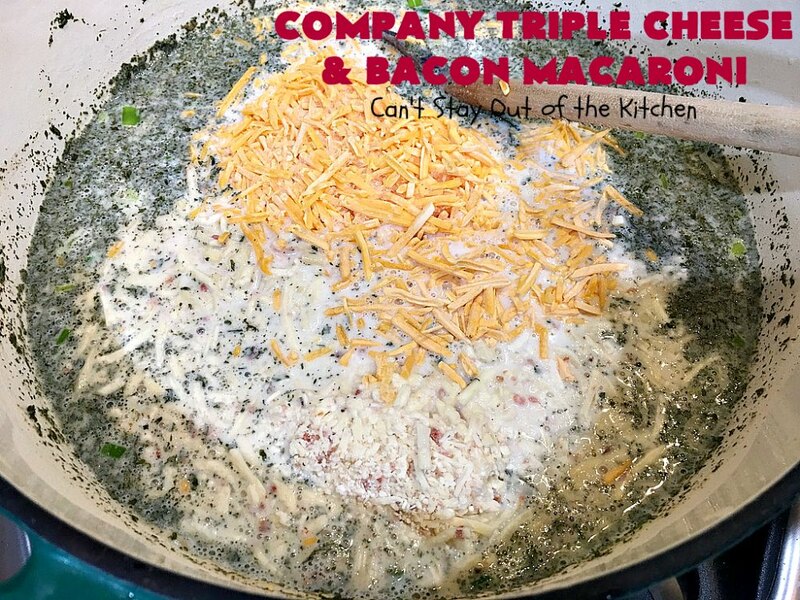 Company Triple Cheese and Bacon Macaroni is so delicious served with BBQ Brisket!